Benedict Cumberbatch Brings Doctor Strange to Thor: Ragnarok | Nerd Much? Waiting for more Doctor Strange news? Wait no more, as Disney has announced this morning that Benedict Cumberbatch will bring his rendition of Strange to Marvel’s Thor: Ragnarok. 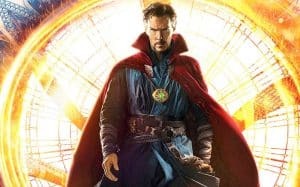 This confirms the rumors that began swirling back in August when Thor actor Chris Hemsworth was seen on set holding Stephen Strange’s business card. Of course, it shouldn’t come as much of a surprise, given the successful launch of Doctor Strange into the MCU in 2016. The Thor: Ragnarok cast continues to grow, as we now know it not only contains Hemsworth, Mark Ruffalo, Cate Blanchett, Karl Urban, Jeff Goldblum, and Tom Hiddleston, but also Cumberbatch (whose star power is undeniable at this point). We also know that the upcoming Thor sequel will mostly take place on planet Sakaar, a “far-off, futuristic place”. Thor: Ragnarok is set to release in theaters on November 3, 2017, and it’s just one of the many superhero films coming in 2017.